Striped cucumber beetles are ~7 mm-long, yellow beetles with three black stripes that reach the end of the forewings, a yellow thorax, and a black head. Larvae are 9 mm long, creamy white with black heads and with three pairs of short legs. Striped cucumber beetle eggs are pale orange-yellow and are laid in groups near the base of cucurbit plants. Adults overwinter in field edges near last year's crop, with a small proportion remaining in the field. With the onset of warm days (usually mid-June), beetles move rapidly into young crops to feed, mate, and lay eggs at the base of the plants. When the eggs hatch, the larvae develop for 2-4 weeks on the plant roots, then pupate in the soil. The next generation of adults emerge in early to mid-August; populations remain high through mid- to late September and then beetles move into field edges to find overwintering sites. Overwintered adult striped cucumber beetles cause direct feeding damage to cotyledons, leaves, and the base of the stem, which can result in reduced yield. Eggs are laid in soil and larvae feed on roots. After the pupal stage is completed in the soil, summer adults emerge. These adult beetles congregate in flowers and may cause damage to fruit, rendering it unmarketable. More mature plants can withstand more feeding damage than younger plants without experiencing a reduction in yield. Beetle feeding spreads bacterial wilt to young and rapidly growing plants, especially before the 5-leaf stage. Cucumber and muskmelon are highly susceptible to wilt; watermelon is not. Striped cucumber beetles can also vector viruses, including cucumber mosaic virus, but not as effectively as aphids. Start scouting immediately after transplanting or when seedlings emerge and continue scouting through the fruiting stage. Scout fields at least two times a week while plants are emerging. 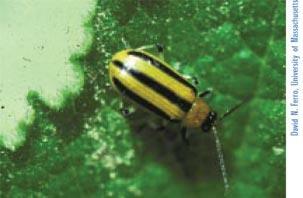 Treatment should be considered when numbers reach an average of 1 beetle during the seedling-to-4-inch-tall stage. To prevent bacterial wilt in susceptible crops, scout for beetles twice weekly at the seedling stage and treat when beetle numbers reach 1 beetle per 2 plants. For more detailed information on management of striped cucumber beetle, please see our Cucumber Beetle, Management article. Rotate crops to reduce beetle numbers. Growing from transplants may allow plants to reach a later growth stage before beetles arrive, giving them the ability to withstand more feeding damage. 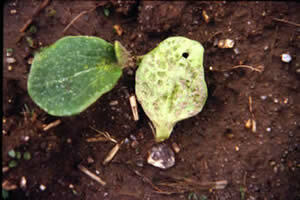 Some repellents or systemics may be applied to transplants outside the greenhouse before setting in the field, which is convenient and allows lower rates of application. Use row cover to exclude beetles. Use hoops to prevent abrasion and remove row cover at flowering to allow pollination. 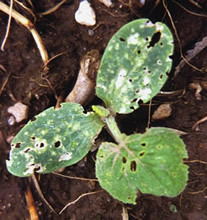 Sprays should be directed at adult beetles, as eggs and larvae are located in the soil and around the bases of plants, where they cannot easily be targeted. Insecticides should be applied before beehives are introduced into fields. Cucumber beetles are most active between dusk and dawn, so contact sprays are most effective if applied in the evening. Cucumber beetles arrive in a field and continue to colonize for about two weeks; if spraying a contact insecticide, wait until peak colonization before spraying to avoid spraying more than once. It is important to consider the susceptibility of your crop to bacterial wilt when determining whether to spray contact or systemic insecticides. For susceptible crops, systemic insecticides may be more effective. For current information on chemical control of striped cucumber beetle, please visit the New England Vegetable Management Guide website.